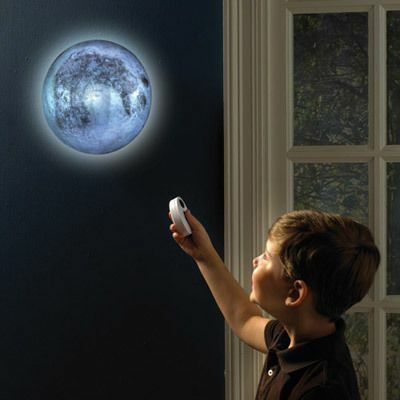 Built-in light sensor illuminates the moon with true-to-life 12 lunar phase moonscape. Auto shut off. Durable plastic; mounts easily to wall. Includes remote control. Uses 4 AA and 2 AAA batteries (not included). For ages 6 and up. 10" dia. "I love the moon and it lights well, but I did not receive any instructions with it and I called customer service to get a copy of the instructions, and they were going to email them to me.... this was a week ago...still waiting."